Unlike Burgundy, where certain vineyards are rated according to their quality, the classification in the Champagne region is rated by villages. Established at the end of the 19th century, the ratings are expressed from 80% to 100%. The 100% wines are considered to offer the highest qualitative potential, taking into account the quality of the soil, the nature of the subsoils and the micro-climate. 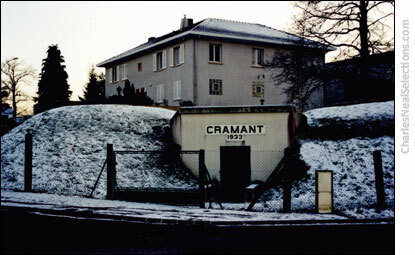 Literally meaning chalk mount, Cramant is situated to the south of Épernay on the renowned slopes of the Côtes des Blancs. Its terroir of chalky sediment ensures excellent drainage and plays an important role in regulating temperature. Its white color reflects light and heat, contributing to the full maturation of the grapes. The subsoil consists entirely of Belemnite chalk (derived from an accumulation of cuttlefish fossils) that is particularly deep on the slopes. In contrast to Cramant, however, which is sheltered by a hill, Avize gets the full blast of the prevailing winds that can be cold and wet in bad years. Le Mesnil-sur-Oger is considered by many to be the top grand cru village in the Côtes de Blancs, if not Champagne. The vineyards are most famous for Champagne Salon as well as the famed Clos de Mesnil of Krug. Bouzy Rouge is released under the Coteaux Champenois appellation. 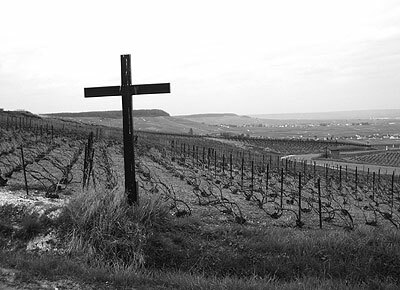 Ambonnay is one of the most sought after sites for Pinot Noir in the Montagne de Reims. Its chalky soils are covered by a thin layer of mixed clay and limestone, ideal for the fruity and vinous qualities of Pinot destined for a secondary fermentation in bottle. At 130 meters above sea level, the grapes are normally protected from spring frosts.